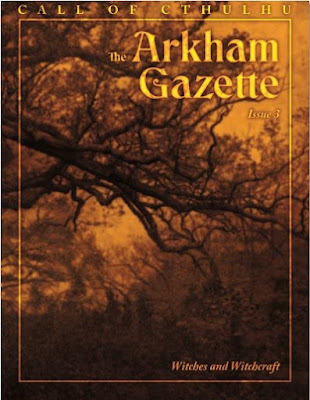 The Arkham Gazette #3 is the third issue of the magazine devoted to Lovecraft Country for Call of Cthulhu published by Sentinel Hill Press and the first to see print. Funded following a successful Kickstarter campaign, it is, like previous issues devoted to specific aspects of Lovecraft Country, that mouldering corner of New England home to old money, old prejudices, and ancient evils. Where previous dealt with places in Lovecraft Country—issue #0 took us along The Aylesbury Pike, issues #1 and #2 visited the towns of Arkham and Innsmouth respectively, The Arkham Gazette #3 explores that most New England of phenomena and does so in depth. That phenomena consists of witches and witchcraft. Of course witches are not unique to New England, but the Salem Witch Trials of 1692 continue to fascinate in the three centuries since their occurence, having figured most famously in Arthur Miller’s The Crucible and more recently in episodes of Buffy the Vampire Slayer, Bewitched, and Bones, amongst others, as well as being the subject of their own RPG, StatCom Simulations’ 1983 Witch Hunt. The Arkham Gazette #3 opens with ‘New England’s Witch Trials’, which examines the history of the region’s witch trials, from decades before 1692 to decades after. The Salem Witch Trials figure prominently, but other trials and investigations across Massachusetts and the other colonies are also discussed. Detailed are included of a witch hunter’s tools of the trade so that investigators can use them in a game, or indeed can have them used against themselves. ‘Witchcraft in Lovecraft Country’ is the fictional counterpart to the historical fact of ‘New England’s Witch Trials’, focusing primarily upon Arkham, Dunwich, and Kingsport to look at known outbreaks of witchcraft, avenues of research in the modern day of the Jazz Age, particular covens and cults, as well as notable locations. These two, quite detailed articles lay the groundwork for much of the issue, first placing witchcraft in the context of the period of the Salem Witch Trials before moving it into the twentieth century. Bret Kramer works with several co-authors in The Arkham Gazette #3. The first of these is Tyler Hudak for ‘Building a Better Witch’ which suggests the types of witch a Keeper could create for a scenario or campaign—white, grey, black, or even false witch—as well as possible sources of power and grimoires, before presenting several new spells such as Animal Form, Enchant Poppet, and Witch. This is the first of a series of articles that guide the Keeper through the creation of a witch NPC and is supported by ‘Gods of the Witches’, a guide to the entities often worshipped by witches. This includes both ‘deities’ and species, and range from Azathoth and Yog-Sothoth to Elder Things and Shoggoths, the choice affecting the nature of the relationship between witch and entity and suggesting what the witch might know and have been taught. Witches also have familiars, traditionally black cats, but in Lovecraft lore the traditional familiar is the Rat-Thing as inspired by Keziah Mason’s familiar Brown Jenkin. Chris Huth, together with Bret Kramer, give an exploration of the Rat-Thing and its variations, in ‘Rat-Things and Worse Horrors: Familiars and the Mythos’. The article details their genesis, and because players are going to be players, it suggests the forensic traces that such creatures might leave and how they might be interpreted, and besides giving Rat-Thing statistics, it lists possible other shapes—Bat-Thing, Toad-Thing, Spider-Thing, and so on. They are supported by several memorable examples of varying degrees of vileness. Lastly, Graeme Price’s ‘Marked by the Devil: Lessons in Lesions’ looks at one archetypal indication that a woman might be a witch, that is, the ‘witch’s mark’. These are primary the ‘blew spot’ and the ‘witch’s teat’, these being discussed as evidence of the Devil’s touch, though medical explanations are also given. The author also suggests links to the Mythos, the ‘witch’s teat’ being a possible link to Shub-Niggurath and her Mother’s Milk, whilst ‘witch’s mark’ might be linked to Hastaur. Given that the focus of The Arkham Gazette is Lovecraft Country and thus the Mythos in the region and New England, it is no surprise that the majority of its witches are of the Mythos variety. This need not be the case, with white or grey witches perhaps having no knowledge of the Mythos, but possibly knowing other magic or something being seen as akin to it. ‘Colonial Folk Magic’ gives options for this, including astrology, healing, wards, and counter-spells. The spells for these are given in the earlier ‘Building a Better Witch’ article. Where ‘Colonial Folk Magic’ perhaps hints at links to the Mythos, Christopher Smith Adair’s ‘Touched by the Fairies’ builds links between the Mythos and legends of the faeries and changelings through the long association of the ghouls with humanity. The author and editor, Bret Kramer delves into two minor elements of Lovecraft lore. The first is August Derleth’s ‘The Lurker at the Threshold’, developed from an unfinished fragment written by H.P. Lovecraft, to give us the tome, ‘Of Evill Sorceries Done in New-England of Daemons in no Humane Shape’. This explores the provenance and details of the eponymous book—much in the same format as that developed by the author for the Masks of Nyarlathotep Companion. The work is either a part of, or a companion volume to, the famed Thaumaturgical Prodigies in the New-England Canaan and may be seen also as an alternative to that work. The second element is another of Derleth origins, that of ‘Witches’ Hollow’, located just outside of Arkham. Here it is described in some detail and accorded a scenario seed or two. A further three seeds are presented by L.T. Barker in ‘The Dried Cat’, all built around the origins and purpose of the desiccated remains of a cat found built into a house being demolished. They include it being a protective ward against black magic, the remains of a familiar, and it having been brought from further afield. Alternative suggestions detail how to use the seed with Sixtystone Press’ The Call of Cathulhu. There are plenty of ideas here that the Keeper can develop as needed, as an addition to an existing scenario, a minor foray into the Mythos, or a fuller affair, perhaps using the material given elsewhere in the magazine. The Arkham Gazette #3 contains a single scenario, ‘The Queen of Night’, which thirty-eight pages long, comprises of nearly a third of the issue. Co-authored by Chris Huth and Bret Kramer it concerns the links between a murder and the questionable parentage of a witch’s line. Set in and around Arkham, it begins with a gruesome, perhap ritualised, death, the scenario pulls the investigators into a rich melange of clues that not only leads them to the culprit, but also points them to something deeper, something more obviously outré in nature. Ideally investigation of the first will lead to the second, the danger being that some investigators may see the identification and apprehension of the culprit as the culmination of the scenario. This, of course, is not the case and investigating the vile cause behind the murder will take no little effort and players who enjoy the investigative process will find something to get their teeth into. ‘The Queen of Night’ is a rich, meaty, if challenging scenario—both to play and run, but is well organised and presented to help the Keeper maintain control of the plot, the clues, and the antagonists. There is the possibility to involve the members of the notorious Arkham witch-cult, though this is not specifically part of the scenario. Doing so enables to tie the Keeper to tie the scenario into a Lovecraft Country campaign. ‘The Queen of Night’ is clearly the highlight of The Arkham Gazette #3, involving a solidly done plot, a set of well realised NPCs and motivations, and an array of difficult choices for the players whilst showcasing how much can be done without recourse to the use of significant Mythos entities. Rounding out The Arkham Gazette #3 is an annotated bibliography of scenarios and fiction. The former draws from both Lovecraft Country supplements and more diverse supplements to create its list of witch-related scenarios, it is presented in a similar format developed for the Masks of Nyarlathotep Companion, giving a summary, location and entity details, noted tomes, plus notes. The list is not quite comprehensive, notably missing ‘An Invitation to the Dance’ from the Miskatonic Library University Monograph, The Primal State. Physically, The Arkham Gazette #3 looks and feels very much like a twenty-year old release from Chaosium, Inc. for Call of Cthulhu as it apes the style of supplements from the early 1990s for the Lovecraft Country line. This includes the use of Cristoforo, Thomas Phinney’s expanded version of the Columbus font which does much to add authenticity to The Arkham Gazette #3. Yet The Arkham Gazette #3 definitely needs a second edit and some of the artwork is rather bland by Call of Cthulhu standards, but the handouts for the players, not just for the scenario ‘The Queen of Night’ and the scenario seed, ‘The Dried Cat’, but also for the article,‘Witchcraft in Lovecraft Country’, are all excellent. The downside to any magazine devoted to a single issue is that its subject matter may not be of interest to every Keeper, but it should be to the Keeper of any RPG of Lovecraftian investigative horror with an interest in Lovecraft Country or said subject matter. There is content enough that can be adapted to other Lovecraftian RPGs as well as applied to periods outside of the classic Jazz Age era, and equally, this content can be run as easily with Call of Cthulhu, Seventh Edition as it can with Call of Cthulhu, Sixth Edition. There is the means here for the Keeper to create a variety of witches, each of which would be memorable in their own way, whether of faith, methodology, or associations. Indeed, some of those associations, the witches’ familiars, are interesting enough in themselves to support either their mistress or a scenario by themselves. Further much of the contents of The Arkham Gazette #3 would be useful in campaigns for Cthulhu by Gaslight as well as classic Call of Cthulhu. The scenario would need some work, but again, the contents of The Arkham Gazette #3 would also work for scenarios set in the seventeenth century, perhaps even for Colonial Lovecraft Country. Where perhaps there is fault with The Arkham Gazette #3 is that as exhaustive and as well researched a treatment as it is of witches and witchcraft, some of the writing is dry, even a little stodgy. Nevertheless, The Arkham Gazette #3 is as definitive a treatment and exploration of witches and witchcraft as there is—and there needs to be—for both Lovecraft Country and Call of Cthulhu.